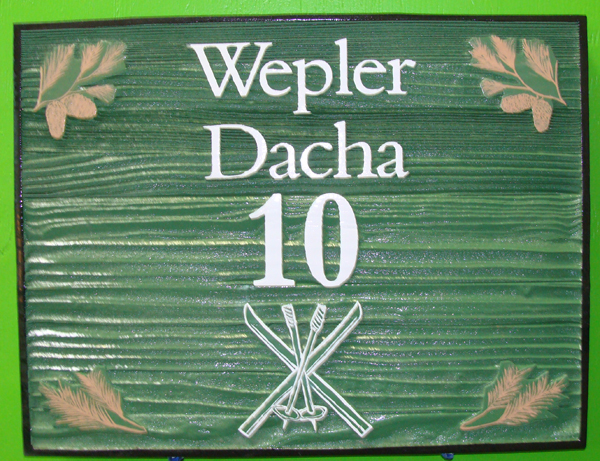 This handsome and natural looking sign is made of sandblasted Redwood. Most of our wood signs are stained and clear-coated, but of course we can paint them as well and they require less maintenance (but more than painted HDU). The text, art and border are raised at 3 levels in 2.5-D (flat) relief. This sign has its text, border and artwork carved in Redwood. After painting, the sign is clear-coated twice. This sign can be mounted on a wall, a door, a gate, on a post, or hung from a wrought iron or wood hanger or an eave beam on a cabin. It will last for decades in snow, ice and rain when properly maintained.